Dispensary assistants play a critical role in the supply and delivery of prescription medicines to the community. In recognition of this important role Guild Training provides two structured courses for dispensary assistants. The Guild’s Dispensary Assistants Courses provide your pharmacy assistants with training options to attain the required skills and knowledge to meet Pharmacy Board’s requirements and equips them to provide the technical support you need. Pharmacy assistants who are required to complete dispensary units to meet their pharmacy’s needs. These courses must be completed within 6 months. There are no formal entry requirements for this course. However students need to be employed in a community pharmacy and will require time to work in the dispensary. Students will be asked to provide their Unique Student Identifier (USI) during enrolment. This is a government requirement for nationally accredited training. Follow the enrolment steps to create/find your USI. These courses are delivered via workbook and completed whilst working in a community pharmacy. Students will also be required to complete Workplace Activity Journals for the dispensary units. Support and assessment is provided by a qualified Guild trainer throughout the course duration. 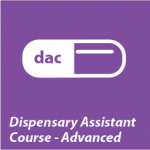 The Dispensary Assistants Courses developed by the Guild meet the Pharmacy Board requirements. Under the age of 18? Download the Parental Consent Form, have it completed and returned to us after you complete you enrol online. Courses includes electronic/PDF Learner Guides (workbooks) as standard. Hardcopy Learner Guides (workbooks) are available for $25 per unit of study. NOTE: Payment of the course fee will be required before course materials are provided. A tax invoice will be issued with payment options during the enrolment process. Please refer to the pre-enrolment information guide for additional information.